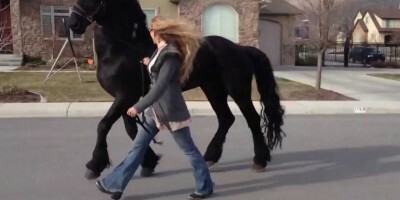 His all black coloring is just as formal as his pretty trot, and he looks as if he want to break out in dance as they cruise down the street. The addition of the video camera on today’s walk has upped his always peppy attitude and he tries to show off with a few whinnies and looks at the camera. Not to mix metaphors, but this horse sure is a camera hog!